The new ITV comedy, 'Edge of Heaven,' only having lasted eight minutes before I lost the will to live, I've warmed-up the PC for a quick blog entry before bedtime. Some nice picture postcard shots of the beach but I suspect our absent diversity champion had been tasked by the council, with removing any marauding staffies and the visible presence of normal day-to-day multi-cultural make-up in the high street. The show's cast, I'm guessing were mostly from Essex rather than Kent but I'm reliably informed the large inflatable willies were sourced locally. 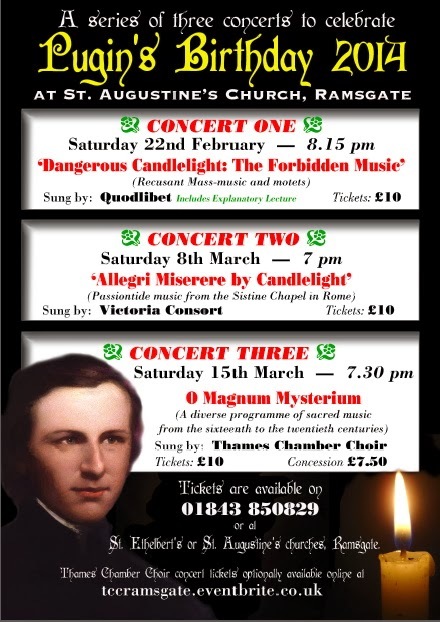 On a somewhat different cultural note, I have been asked if I could promote the forthcoming Pugin's birthday concerts with the poster opposite and I'm very pleased to. Tomorrow, I'm scheduled out with my replacement aircraft, to Portsmouth with a banner demanding the mayor's resignation over the loss of the naval dockyard; Twitter #CEPACTION. For the first time this year, the weather forecast looks to be just about within my working limits from Lee on Solent airfield, so fingers firmly crossed. It may cause a small stir. This afternoon, the Observer newspaper tied-up their interviews on my 'Under Caution' story and I'm told this will appear in print on Sunday. Astute readers may have noticed that the local paper has, as yet, shown no interest in the matter while a national Sunday newspaper has. "Many good people become involved in local politics to stand for something, to have it make some difference. Not to become the target of vexatious complainants or the criminal justice system, simply because they might hold a contrary opinion on a matter of public interest." At this time the police appear quite unable to determine whether the simple action of ticking 'Like' on a Facebook comment may constitute a criminal offense of harassment and have referred the matter to a higher authority to decide. This led me to ask the journalist whether liking a comment made by Nick Griffin was worse than liking one make by Nigel Farage? It's a vexing question, as I'm sure you will agree and I'm no closer to finding out the truth. So, dear reader, the police appear to be saying their resource-intensive investigation into a harassment and conspiracy complaint against three local councillors, was prompted by the intervention of Ms Barnes but this is directly contradicted by the statement given by her office on Thursday. As you can imagine, this has left me somewhat perplexed and the Home Affairs Editor of the Guardian too I suspect. What The Observer newspaper will make of it all, is hard to say but I was keen to have someone else take a view on the political farce which is presently playing out here in Thanet and at some point, the authorities are going to have to act rather than obscure the facts. In such matters, going to one's MP and The Guardian may hurry matters along a little. Perhaps we ought to be careful about "Unfriending" too, suppose offence is taken? I said on these pages some time ago that Facebook was old hat, and another contributor, who shall remain nameless, was going to let the whole of Thanet know of my opinion. I am still waiting for the result of the vote. Surely the fact that you "Like" something cannot be an offence. We are talking about freedom of speech here. It is odd why the local press remains silent on this matter. I would have expected them to have a deep and impartial interest in matters of the law: curious. I did not see 'Edge Of Heaven'. In the Radio Times the critics slammed the programme likening it to a bland 1970s sitcom complete with jokes from that period. In another life I installed the ILS Outer Marker at Lee On Solent, then HMS Daedlus, in the days not so long ago when we had ships and ports. Simon, Can you please clarify is the article to appear in the Observer or the Guardian or both? I have serviced many an Outer Marker, Middle Marker, Localiser and Glidepath too, including HMS Daedalus. The Story goes that an RAF crew wanted to investigate the delights of nearby Lee on Solent and were walking out of the main gate when they were stopped by a sailor on duty. He asked them what they were doing, and when told that they were going out advised them that they couldn't because the liberty boat wasn't due to sail. Turning round they disappeared behind an adjacent building, only to return a few minutes later in bare feet and with there shoes and socks in their hands. They advised the sailor not to worry about the liberty boat because they were going to paddle ashore. Sorry Lyndon you'll have me introducing a sanity test as well barring anonymous comments. I will simply have to make do with banning you as the simpler option.